As a marketing professional, you need to keep up-to-date on the latest trends. This can help you improve your marketing campaigns and stay ahead of the competition. But given how quickly the B2B industry changes, how can you tell what to add to your strategy? As you update your marketing strategy, don’t forget the importance of understanding your buyer personas. Segmenting your data by title, job function, company size, and industry can provide deeper insight into your best buyers. As a result, you can then send content to match your buyers’ individual needs and interests. This helps you increase engagement and generate more revenue. If you’re a marketing professional, you’ve most likely heard of “Mobilegeddon.” Earlier this year, when Google announced it would change its algorithm to rank mobile-friendly sites higher on mobile search results, people panicked. In fact, since the announcement, there has been a 4.7% increase in mobile-friendly sites. If you want to avoid decreased traffic, follow this trend and make sure your website is mobile-optimized. Sales and marketing alignment is not a new trend. However, it came into the spotlight again when key players in the B2B industry spoke on the topic at this year’s SiriusDecisions Summit. Did you know that companies with strong sales and marketing alignment achieve a 20% annual growth rate? And yet, 76% of content marketers forget sales enablement. In order to see truly results, your sales and marketing teams need to work toward common goals. If you haven’t already prioritized email marketing campaigns, you should start now. Email marketing allows you to engage with your current customers, as well as potential buyers. In addition, it can have a significant impact on marketing ROI. The best way to improve your click-through-rate: sending targeted content. Rather than using a “batch and blast” approach, segment your lists based on buyer behavior. This will help you understand their pain points, so you can work even more leads through the funnel. 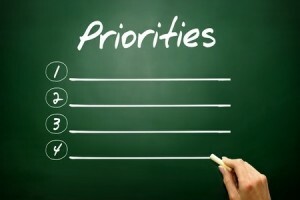 As a marketing professional, what trends are you prioritizing? Let us know in the comments below.